CHARLIE THE CHOO CHOO. First Printing Hardcover. by Beryl Evens (aka Stephen King). 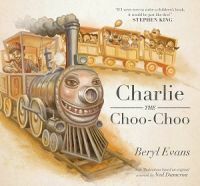 Charlie the Choo-Choo hard bound book by Beryl Evans was originally given away at the 2016 San Diego Comic Con as an exclusive. She is fictional character created by Stephen King and is from The Dark Tower. A part of a deep-dive viral promotion for The Dark Tower, Stephen King fans at San Diego Comic-Con swarmed to get copies of an intense-looking children’s story called Charlie the Choo-Choo. There was no barcode, so those copies will only be available in collector markets, and only about 150 of the hardbacks were handed out. Within hours, they were turning up on eBay for between $1,600 and $5,000. We have a few copies left of the first printing edition. Only 30,000 copies of the first printing were produced according to the publisher, Simon & Schuster. Now in 3rd printing as I type this in early December 2016. Fans of Stephen King’s The Dark Tower will definitely want this picture book about a train engine and his devoted engineer.